EDMONTON – Marc Kennedy had just one thought in his mind: throw it hard and straight. 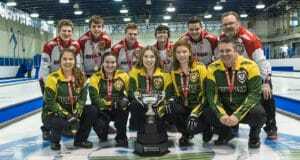 The Alberta second did just that with his last rock, earning four points to edge defending champion Wayne Middaugh of Ontario to win the Ford Hot Shots competition Saturday on the opening day of the Tim Hortons Brier, presented by Monsanto. 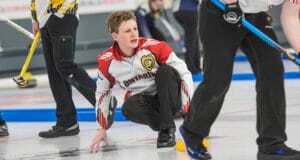 Kennedy outscored Middaugh 4-2 on the final shot – the double takeout – to nip the Ontario third 22-21 in the final. Oddly, neither had tried the shot in their practice prior to the final. 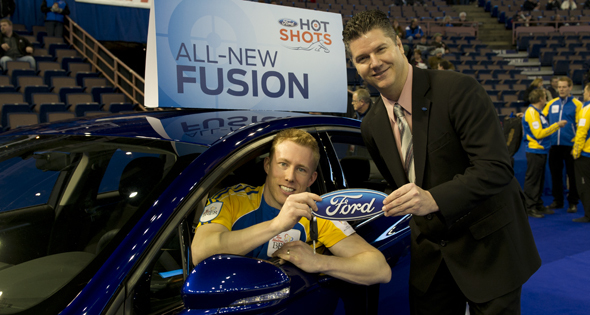 The 31-year-old RBC Olympic ambassador who has won two Briers, a world championship and the 2010 Olympic gold curling with Kevin Martin’s rink, said it was an advantage throwing last, knowing he needed just three points to win the title and the two-year lease of a Ford Fusion SE. The annual Hot Shots competition sees curlers throw six different shots: hit and stay, draw the button, draw the port, raise, hit and roll and double takeout. Each shot is awarded points on a scale from zero to five depending on the end result of the shot. Middaugh won $2,000 for finishing second. 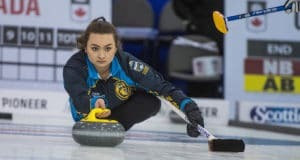 “The boys were putting pressure on me, saying we have to keep the Ontario streak going,” said Middaugh, whose victory last year was the fourth straight for Ontario curlers. “I just threw my last one a little in, just needed to curl another half inch. In the semifinals Middaugh beat Brett Gallant of Newfoundland-Labrador 23-20 while Kennedy beat Sean Ledgerwood of Prince Edward Island, 26-18. Gallant’s 20 points gave him third place and $1,000 for the Brier rookie. The 23-year-old business student said there wasn’t any pressure facing Middaugh since he’s played against him numerous time. Gallant lost points on his first two shots and couldn’t recover. In the quarter-finals, Brock Virtue of Saskatchewan (16 points), Jon Mead of Manitoba (18), John Morris of Alberta (19) and Éric Sylvain of Quebec (22) were eliminated. Sylvain was tied with Gallant but in the sudden-death draw to the button he came up short of the four-foot while Gallant was biting the button.